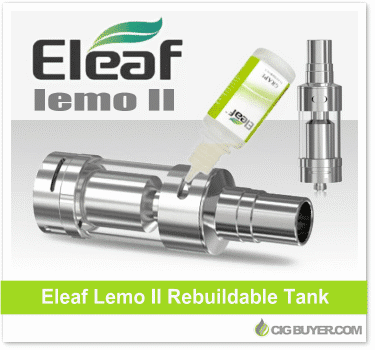 The Eleaf Lemo 2 is a follow-up to the popular Eleaf Lemo Tank. This Kayfun-syle rebuildable tank atomizer (RTA) is constructed of stainless steel and glass just like the original, but it has a new and improved adjustable airflow system with a unique feature found nowhere else – a fill hole located on the side. Just twist to open and then top it off with your favorite e-juice – up to 3.8ml. The Eleaf Lemo II includes an easy-to-build deck area, wide bore (replaceable) drip tip and PEEK insulators to help extend life. Side fill – no more mess!